Sure, guys like to fill a VersaTube garage with tools and workbenches, lawnmowers, storage containers, boats, and cars - but there’s a whole lot of reasons the woman of the house would love to have a VersaTube Garage as well! Greenhouse - the frame of a VersaTube garage is perfect for building a greenhouse. It’s more sturdy, and more budget-friendly, than a wooden frame. 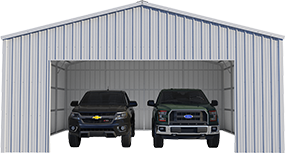 Simply pick a frame-only garage from any of our models, and then you can finish it as a greenhouse instead of a steel garage. 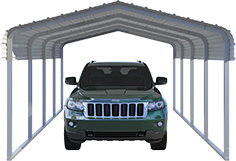 She Shed - VersaTube garages are completely customizable and can be finished anyway you like. Add plumbing, electricity, and drywall and your garage has turned into bonus room you can do anything with. So why not make it a she shed? You could go for a craft room, home gym, game room, home theater, art studio - just to name a few. Your imagination is the only limit! Home Office - whether you work from home, bring home work, or have a side gig, getting the quiet space you need to do your best work can be a challenge inside a busy home. Why not build a VersaTube garage expressly as a home office? Whether you need an assembly table and shipping station for your online business or a dedicated computer you know you won’t have to kick the kids off before you can catch up on work, a home office in the garage is the perfect solution! Do you trip over bikes, sports equipment, or storage boxes as you walk through the garage after parking your car? The completely customizable VersaTube garage is an organizing mom’s best friend! If you need a bit more room inside, you can add a loft to your garage so you have more storage space, or even get an expansion kit that lets you enlarge the space a bit. Try doing that with a wood building! Have an idea of what you’d like to do with a VersaTube garage of your own? 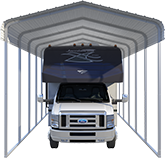 Check out our models, or use our Design Your Own Tool to build a garage that fits your needs exactly. Let’s get started!